Cost and innovation pressure are the key drivers for the switch to product line development. However, the hoped-for shortening of development cycles requires a close cooperation between platform development and the various customer projects. If these are complex products with a large number of components and supporting specialist groups, which previously worked on the basis of a common model, completely new challenges arise at the model level. The so-called “basic software”, which forms the basis of the individual product lines, as an independent platform to establish and adapt and extend it in individual customer projects, is not easily possible with today’s standard modelling tools. 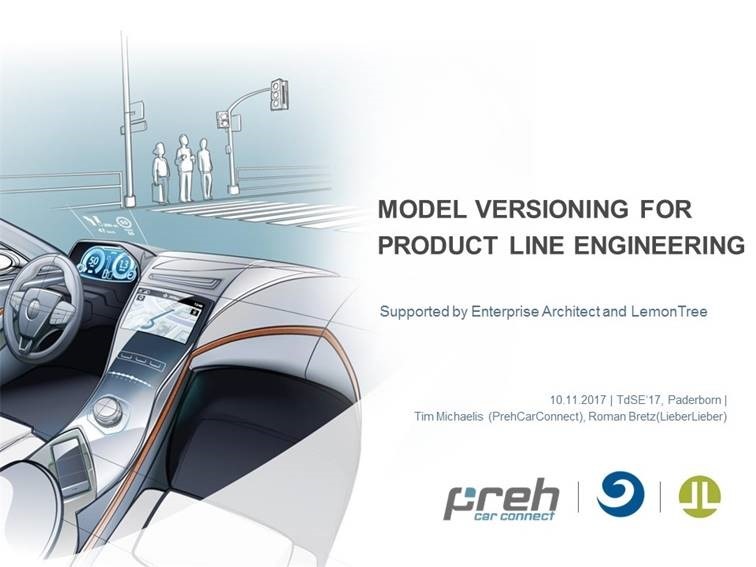 In a joint presentation at TdSE 2017, Preh Car Connect and LieberLieber presented a concept for modelling with Enterprise Architect, which aims to work on different model versions in a distributed manner, but to keep the “basic software platform” always in a consistent state. The central idea of this concept is the application of existing approaches that have established themselves in the area of configuration management of source code.